Leolinda Bowers listed another Superior Sun City Grand home! 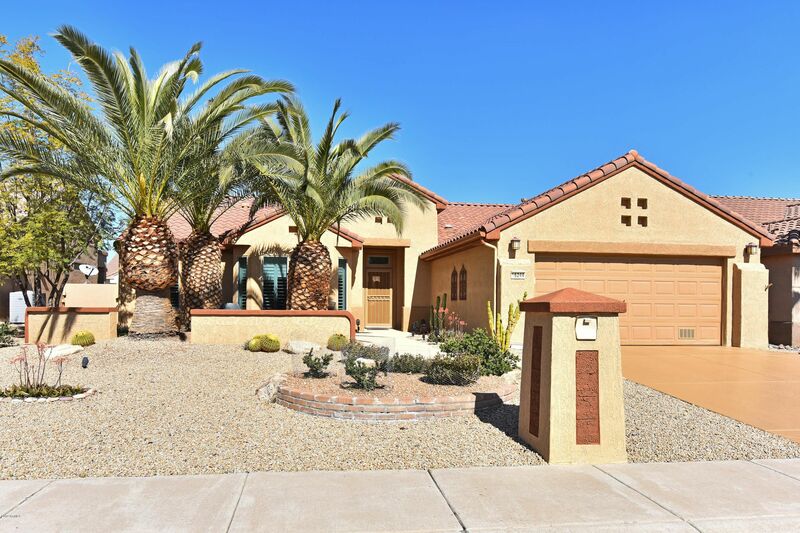 The Palo Verde model, is a Del Webb favorite with its split bedrooms; the master suite is on the opposite side of the house from other sleeping areas. Kitchen is a chef's delight with its 42-inch European cabinets, upgraded appliances and its wide-openness allowing the chef to show guests his/her talents and keep the conversation flowing. During construction the Master Bedroom was extended by four feet plus a bay window was added. The den was also extended by four feet and custom built-in's were added. Fine features include oak wood flooring, gas fireplace, master bedroom exit door to patio, Closet organizers in master, vessel sink in guest bath, desired raised panel doors, Anderson Windows, three security screen doors, Extended garage, paver walkway, Vacation Mailbox and PVC Irrigation System. The front courtyard patio is a welcoming feature for your guests. Homeowner has enjoyed the extended outdoor patio with its secluded ultra-special resort style backyard entertaining and relaxing with family and friends.